With the kids back at school and the older ones en route to University I really don’t have any more excuses to avoid the teetering pile of post and paperwork that is threatening to topple off the shoe rack and concuss Doughnut. I’ve been putting this particular job off for days, probably because I know there are more bills than cheques lurking there and I really don’t want to plough through that pile of receipts to see just how much I spent on holiday. I’ve already worked out that if I bought an average of four ice creams every other day at $3 each that will have cost me $180! You can see why I’m reluctant to think about the cost of flights and dinners out! And it looks as if I’m not alone. A survey by Kalixa Pay, the people who provide pre-paid Mastercards, showed this week that our summer holiday is rapidly turning into a Christmas-style financial hangover that can take up to three months to clear. 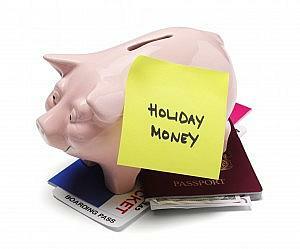 Apparently the average amount we save for a two-week holiday is £600 but on average we tend to go over budget by £150 and a quarter of us are still paying for our holidays three months later. An alarming ten per cent of us run out of money on day two!